It was one of the most potent 30 minutes I’ve ever witnessed. When I walked into the room at Old Mill School, I expected to see a ‘typical’ Kindergarten dance class. Instead what occurred, under the expert guidance of Young Imaginations’ Alan Scofield, was a feast for the bodies, hearts and minds of 24 children. Throughout the class, I had a big smile on my face which matched the delight and joy the kids experienced while they were served this highly nutritious and delicious ‘meal’. An apt metaphor given Alan’s analogy of “putting medicine into sweet cake” to describe the learning experience he provides for his students. It’s not surprising that in addition to his love for dance Alan has a strong passion for arts integration and the understanding of somatics (body intelligence). He brings these disciplines together with other powerful learning methodologies to enhance our children’s education. This was vividly demonstrated in the kindergarten class I observed. Alan packed in a wide array of topics and approaches to awaken learning in the students. From rhythmically moving their bodies to singing songs; from doing yoga and breathing exercises to choosing dance partners; from learning about the ‘Golden Rule” to making patterns with their hands; from dancing the Guajira while learning about Cuba to listening to a story about a family of robins watching a human picnic. This class addressed many facets of the whole person while covering a multitude of topics. The social and emotional skills that support teamwork, motivation, and self-expression were building right before my eyes. Yes, this all happened in just 30 minutes! Thanks to Kiddo!, the children in the Mill Valley School District are fortunate to have dance education in an integrated fashion. Recent statistics report that less than 20% of public schools offer any kind of dance program or have it integrated anywhere in their academic curriculums. Yet, this form of learning is essential to educating the whole child. Dance opens dimensions of knowledge that go much deeper than a simply intellectual understanding. It enables kids to embody knowledge through participative and experiential learning. An example of this is when the children in the class demonstrated their understanding of the world of nature when Alan told them to show what it’s like to be ‘wide as a river’, ‘reach for the sky’, and ‘come to the earth’. One of Alan’s mottos, “Show me you know it by how you do it”, deepens the children’s connection to what they know. The MVSD dance program begins with 32 weekly classes at the kindergarten level. It is again offered in 4th and 5th grade. Grades 6-8 receive a fifteen session dance program during P.E. This year, for the first time, a pilot dance program is also being offered to the 1st-3rd grades in conjunction with PE. 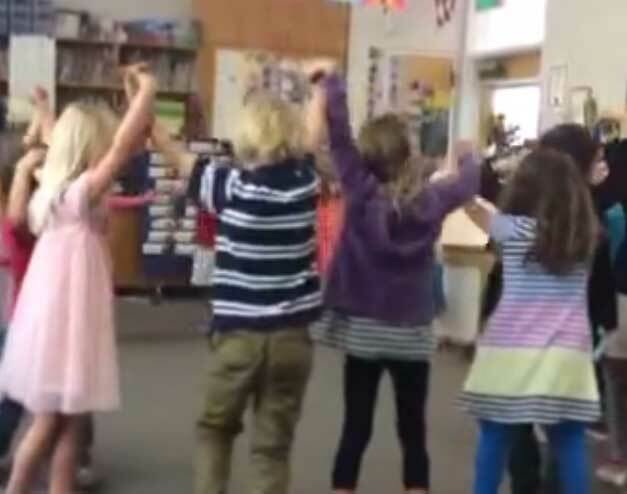 This new pilot, taught by Alan’s colleague Paula Gianetti, provides dance continuity for kids in each year of their elementary school experience. Alan’s vision is for dance to be integrated into specific curriculum topics at all grade levels. For instance, if a grade is studying the oceans, he suggests they look at the dance in the coastal cultures of Brazil, Greece, and Trinidad. Dance can teach us dimensions of other cultures that other modalities cannot. By learning and performing the dances from differing cultures our children learn about other cultures’ values and worldviews. Dance uses movement to create meaning about the human experience and thus we come to understand and appreciate different worlds in ways that a mere intellectual understanding cannot instill. In doing so we expand our perception of the world around us, leading to greater inclusiveness, collaboration and innovation… critical skills that will enable our children to be successful in their future education and vocations. Thank you Alan, Paula and Sharon Scofield (kinder dance extension) for the artistic literacy you’re offering our kids. And thank you Kiddo! for funding and supporting an education that awakens our children’s hearts, minds, and bodies.